Janko: “Tell me where the Virgin will give that sign. Vicka: “On Podbrdo. At the sight of the first apparitions. Janko: “Will the sign be in the Heavens or on earth? Janko: “Will it appear spontaneously, or will it gradually appear? Janko: “Will everyone be able to see it? Vicka: “Whoever comes here will. Janko: “Will the sign be temporary, or will it be permanent? Janko: “Will the sign be able to be destroyed by anyone? Vicka: “The Virgin said so. Janko: “Do you know exactly what the sign will be? Janko: “Do you know when the Virgin will make it evident to the rest of us? Vicka: “I know that also. Janko: “And why is the Virgin leaving the sign here? Question: “Jakov once said, in an interview with Radio Maria, that in order to see the sign it will be necessary to come here to Medjugorje, is that true? Vicka: “Yes, it’s true. The sign will remain on Podbrdo, and one will have to come here to see it. This sign will be indestructible and will remain in that place forever. I want to say about those people who will see it and not believe, the Madonna leaves everyone free to believe or not, but those are ones whose hearts are too closed. It’s the same thing as the Madonna said to us, ‘If one wants to go to Heaven, he will go to Heaven. If one wants to go to hell, he will go to hell.’ Those people who are far away from God and do not want to believe, they will not believe in the sign. For those who do not know God, but have good intentions and a desire to love, they will be benefitted by the sign. But I think that those who do everything against God, they will run away from the sign. They will not believe. Question: “So, this is a time of grace. This is the time of conversion. The Madonna said, ‘Don’t wait for the sign in order to convert yourselves.’ So why leave a sign like some last extreme help: is it in order to move the Church to recognize the apparitions as authentic? Vicka: “Yes, certainly it will be for the Church, so that they will have no doubt that the Madonna had been among us, and it is also for those who are still far away from God. So the Madonna is thinking about both groups of people, and then it is up to us how to be ready to respond to Her call through the sign. Everyone who comes, who will see, you know, you can say, ‘I don’t believe it’ and that is your personal idea, that’s what you believe, but that the Madonna is here, that She is present, that She leaves this sign, a sign that no man can make; it is something only God can make and so nobody will be able say that it is a small thing or something else. This arrives in such a way that they won’t have words to say what it is. Question: “So, in essence, the discourse is this: the Madonna urges us to convert. She tells us not to wait for the sign on the mountain in order to convert, and in any event, ‘all the secrets that I have confided will be realized and also the visible sign will be made manifest. When the sign comes, for many it will already be too late.’ What does that mean? Vicka: “The Madonna did not explain why it will be too late and I did not ask, She only said that we are now living in a time of grace. Question: “So, it is important to convert before the sign is made manifest? Question: “Has Our Lady given any indication that She will leave a sign or miracle at Medjugorje as She did at Fatima? Question: “Mirjana, what, if anything, are you permitted to tell us about the Ten Secrets? Mirjana: “The first two secrets come as advance warnings for the whole world and as proof that the Blessed Mother is here in Medjugorje. Question: “And the third secret? Question: “For clarification purposes, the great sign for all non-believers, will it take place on Apparition Mountain behind us or where will it take place? Marija: “Our Lady told us that She will leave the sign on the Hill of the Apparitions. Question: “Is there anything you can tell us about the sign the Blessed Mother has promised to leave us? Question: “You and the other visionaries have indicated that there will be advanced signs [signs preceding the great sign] in many places in the world to warn the world. When will these advanced signs begin? Marija: “There are signs in many places in the world now. Many people see luminary signs. Many experience personal healings, both physical and spiritual, and also psychological. Many have private signs. People have come here from all over the world. Often they have or have had extraordinary signs in their lives. Question: “Will all people on earth believe in God, in the Blessed Mother when the permanent sign occurs? Marija: “The Blessed Mother has said that those who are still alive when the permanent sign comes will witness many conversions among the people because of the sign, but She also says blessed are those who do not see but who believe. Question: “Mirjana told me that there will still be some unbelievers even when the permanent sign comes. Marija: “The Blessed Mother has said there will always be Judases. Question: “Vicka told me that there is great urgency in the Blessed Mother’s call to immediate conversion. She said that for those who only marginally believe, who choose to wait for the great sign to believe, it will be too late. Do you know why it will be too late for them? Question: “Do you know when the permanent sign is coming, Jakov? Jakov: “Yes. When the permanent sign comes, people will come here from all over the world in even larger numbers. Many more will believe. Question: “Will all people believe because of the permanent sign, Jakov? Jakov: “The Blessed Mother said that there will still be some who will not believe even after the permanent sign comes. Question: “Do you know what the permanent sign is, Jakov? Question: “Can you tell us anything about it? Jakov: “It will be something that has never been on the earth before. Question: “Jakov, why will some still not believe? Question: “Do you know when the permanent sign is going to come? Question: “Is it going to be in your lifetime? Question: “When the permanent sign comes, will everybody in the whole world believe because of the sign? Question: “What happens to those people who don’t really believe enough right now to convert and want to wait until the permanent sign comes? So what are the ten secrets of Medjugore, as most of them seem to be shrouded in mystery? Well if you take the account of the visionaries from the outset, which began with all six seers having apparitions on a hill, known as Mount Podbrodo, on June 24th 1981. In these apparitions, Our Lady conferred to the visionaries that she has come to tell us that God exists, and asks us to spread the message of peace Pray, fasting and to go to confession at least once a month, and also read our Bibles, as well as receive the Eucharist daily where possible. Our Lady also told the visionary that before the final apparition takes place a visible sign would be left on Podbrodo or the hill of apparitions, as it is more commonly known. So that non-believers will convert. It is also clear that when this miracle takes place, those present that need healing will be cured. In a clear affirmation to the apparitions at Fatima in 1917 on August 25, 1991 Our Lady said "Dear Children! Today also I invite you to prayer, now as never before when my plan has begun to be realized. Satan is strong and wants to sweep away plans of peace and joy and make you think that my Son is not strong in his decisions. Therefore, I call all of you, dear children to pray and fast still more firmly. I invite you to realize through the secrets I began in Fatima may be fulfilled. I call you, dear children, to grasp the importance of my coming and the seriousness of the situation. I want to save all souls and present them to God. Therefore, let us pray that everything I have begun be fully realized. Thank you for having responded to my call." We are now approaching the 26th anniversary of those first apparitions and we know that three of the visionaries have received all ten of the secrets and no longer have daily apparitions Jakov Colo who was ten at the time and who is now 36 received the tenth secret on the 12th of September 1998 He now only receives messages annually this is the message given him on December 25th 1998. After the apparition, which began at 11.50 a.m. and lasted 12 minutes, Jakov wrote: "Our Lady came joyful. She greeted me, as always, with 'Praised be Jesus!' She spoke to me about the secrets and afterwards gave me this message: "Dear children! Today, on the birthday of my Son, my heart is filled with immeasurable joy, love and peace. As your mother, I desire for each of you to feel that same joy, peace and love in the heart. That is why do not be afraid to open your heart and to completely surrender yourself to Jesus, because only in this way can He enter into your heart and fill it with love, peace and joy. I bless you with my motherly blessing". Jakov prayed with his family. He prepared himself for the apparition with Confession and Holy Mass. After the apparition, he cried for a while. April 25, 1992 "Dear children! Today also I invite you to prayer. Only by prayer, and fasting, can war be stopped. We know that before the visible sign that there will be three admonitions or warnings on earth We will be forewarned of these events as Mirjana will be a witness and tell Fr. 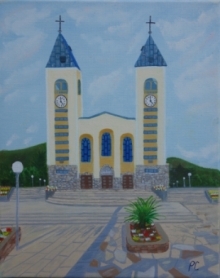 Petar Ljubicic in Medjugorje 10 days before the secret occurs. Both will then fast and pray for one week and then Fr Ljubicic will tell the world three days before the secret transpires. It is also Mirjana who received a parchment from the Blessed Virgin Mary, which contains the ten secrets. But Mirjana safely assures us it is not possible for anyone to see what is written as even family members were at a loss, as it is of a supernatural origin and has been scientifically tested. It so happened that Mirjana was staying with her grandmother in Bijakovici, and how she would become the second to see the Blessed Mother that June summers day in 1981, and the first to receive all ten secrets. Our Lady has decided it is Mirjana who will pray for all unbelievers, those who have not felt Gods love, and this is indeed what occurs on the second of each month. Mirjana prays and is not aware when Our Lady will appear, only that she will.